B's CVF, inc is a small family farm owned exclusively by the 8 members of the Bauman family and operating in rural Garnett, Kansas. This family farming operation began in 2001 on their 160 acre farm. After 15 years of farming, we still have everything left that we started with: all of our land and all of the original farm family. As a result of the varied interests of the family members, B's CVF, inc has several DBAs that operate independently yet co-operatively. Bauman's Cedar Valley Farms OBA handles the animal production and product marketing, Bauman Brothers OBA manages the grass and grain production, Bauman's Farm Feeds OBA mills and markets livestock feeds, Bauman's Butcher Block OBA processes red meat under USDA inspection and ANCO Processing OBA operates the USDA processing of the poultry. (This may sound like a large operation, but one must realize that this is simply what a diversified family farm looks like legally.) As a beginning farm, the majority of farm decisions and operations were conducted by the Bauman pre-teens. Today, with the youngest Bauman at 16 years, this youth-leadership in family farming has resulted in a highly diverse operation that the next two generations are an active part of. From their start, the Baumans have made sustainable farming practices a keystone to their farm operations. 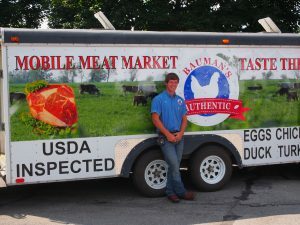 In an all-pasture based system the Baumans raise and market chicken, eggs, turkey, duck, duck eggs, goat, hogs, and beef. These are then processed in the family's own USDA plants. The monogastrics are supplemented with non-GMO grain raised, roasted and milled on farm. All farm products and services are not exclusive to the Baumans but are shared with their neighbors. Project coordinator Rosanna, at age 28, has been actively teaching sustainable agriculture at area conferences and field days for 10 years. An avid seeker of solutions for beginning farmers, she has been the lead in multiple research and grant projects. She also serves as the local farmers market manager and a Kansas Farmers Union boardmember. D & N Ag Farms, Waverly, Kansas. Raising both non-GMO grains and livestock in harmony, Darrin and Nancy Williams focus first on their soil quality, enriching it by utilizing no-till and cover crops. They are transitioning out of using any herbicide or pesticide as the soil is regenerating itself and developing natural disease resistance. Out of this healthy soil grows especially nutrient-dense grass and cover crops that their British White cattle and Katahdin lambs can consistently fatten on, yielding a well-marbled, sweet flavored meat. Darrin is an avid supporter of these farming practices, speaking at conferences and hosting his own farm field days. Additionally, they have just started their own non-GMO seed cleaning and sales business to make non-patented seeds available to the region. Valley View Elk Ranch, Garnett, Kansas. Rodney and Rachelle Miller have been breeding and raising elk in Kansas for 20 years. This lean red meat is processed in Kansas and sold at various farmers markets. Known for their award winning recipes for naturally-processed elk jerky, pemmican, deli meat, and summer sausage, the amazing flavor of their product has won over many a dubious shopper. It is a testament to their quality that most of their meat is sold at small town markets 30 miles from home. The Millers utilize all aspects of these unique livestock, harvesting the velvet for medicinal purposes and the antler and teeth ivory for purchase by artists. The Millers are experts in their field, serving on the board of the National Elk Producers Association and learning from their peers. The family farmers in Kansas and across America are experiencing a double downturn in the farm economy. Commodity prices for grains and livestock are dropping simultaneously. As a result, commodity farmers are actively looking for alternative marketing methods, even if it means learning new production methods. While some farmers are looking towards niche farming practices to help boost farm profitability, the small scale farmers already involved in the niche marketing of their sustainably grown products are likewise experiencing a shift in their own farm economies. The reliable standbys of farmers markets across the state and nation are experiencing drops in attendance. Additionally, the nation’s new farmers are predominately adopting sustainable farming practices. This results in an increasing number of farmers utilizing grass-finishing for their livestock, who then will be looking for direct­ marketing channels for their premium product. Farm conferences are doing excellent jobs of teaching farmers about the benefits of sustainable farming practices. Farmer training programs are doing great at providing the farmers with the practical knowledge needed to implement these practices. But then the farmer has to hack his own way through the marketing jungle. The quantity that most food hubs need is not feasible for most beginning farmers, nor is wholesale in general. 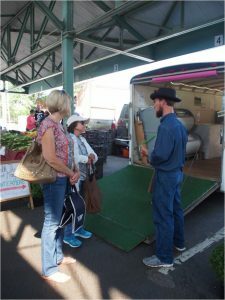 In the past, beginning farmers have relied on farmers markets to help foster their growth, but farmers markets are seeing drops in attendance, and a lot of markets are at vendor capacity. We think this lack of direct-marketing success for family farms has multiple reasons: (1) Consumers are increasingly “greenwashed” as more corporate giants enter the marketplace and (2) Farmers are not utilizing the proper marketing method for their farm size and/or goals. Additionally, we are dealing with an industry that is hybridizing commodity and niche farm products. After ruminating on the looming niche marketing crisis, the Bauman family gathered for a brainstorming session. We went against the grain in search of a solution and found ourselves with a concept we term the “Mobile Meat Market”. For the last quarter of 2016, the Mobile Market traveled 4 days each week selling the Bauman family’s chicken, eggs, turkey, duck, grass-fed beef, pork and goat. Grass-fed lamb was sourced from D&N Farms. Jams and Christmas candy were then added from another neighbor. The past 4 months have given us a great snapshot into this marketing method’s potential and we now find ourselves needing to move this to the next level. Going forward, we ask the assistance of a SARE Farmer Rancher grant as we research the potential this marketing method has when expanded to include more diverse products from more small family farms. This project seeks to expand into a taller, wider trailer for more display space, as we are at capacity in the current 20′ trailer. More space will also enable a kitchenette so that hot foods featuring the farmers’ products can be served out of the Mobile Market, adding a food truck aspect. Increased space will enable us to cooperate with multiple farmers for more products. Valley View Elk Ranch jerky, Ratzliff Red Wattle Pork, D & N Farms lamb and beef and Bauman’s Bakery rolls and jams can be added immediately. Products from other local entrepreneurs will be added as demand allows. The object of this project is not to provide farmers with a blueprint for direct marketing success, because there are no models for direct marketing. However, our object is to be an example of outside the box possibilities in direct marketing and the importance of finding a marketing model that works for your farm. 1. To be an example of outside the box possibilities in direct marketing and the importance of finding a marketing model that works for your farm. A. Research the potential of an expanded Mobile Meat Market that includes a food truck and more diverse products from more small family farms. The object of this project was not to provide farmers with a blueprint for direct marketing success, because there are no models for direct marketing. However, our object is to be an example of outside the box possibilities in direct marketing and the importance of finding a marketing method that works for your farm. We researched the potential of a Mobile Meat Market expanded to include more diverse products from more small family farms. This project seeks to expand into a taller, wider trailer for more display space. More space will also enable a kitchenette so that hot foods featuring the farmers’ products can be served out of the Mobile Market, adding a food truck aspect. Increased space will enable us to cooperate with multiple farmers for more products. Our conclusion: This mode of direct marketing INCREASES our ability to make a profit, it does not guarantee it. However, this method gives us more control over many of the variables. The question then must be asked: do we want or are we capable of handling this increased marketing responsibility? Essentially, this opens the door to providing all sorts of value-added products, similar to grocery store’s meat and deli counters. Instead of just selling whole chicken, I could be selling 20 products made from chicken. The mobile-market concept is a good alternative to a brick and mortar store-front. In response to this research, the Bauman family is looking for staffing, marketing managers and new locations to expand into. We believe that this mobile-market method is a good fit for our farm. We can increase the variety of products sold to our existing customer base, which is essential for a small farm. Small farms must produce and market one item to many buyers, or alternatively, market many items to fewer buyers. We chose the latter as the best fit for our family farm. The Williams family is also supportive of this cooperative marketing avenue as the increasing vitality of their farm’s soils is supporting more animals per acre, but they have no desire to increase the hours that they spend off-farm in marketing pursuits. Immediately upon notification of the FRG proposal approval these things will happen in rapid, consecutive order: April 2017: Custom trailer with ramp doors for wheelchair access and easy-clean floors and walls ordered from Sharp Manufacturing, a Kansas company. Our experience in 2016 has illustrated that custom-building a trailer doesn’t cost that much more and makes it much more customer friendly. Delivery expected in 3 weeks. May 2017: Trailer Signage for the trailer sides will undergo the artwork design and printing while the trailer is being built so that, upon trailer completion, the full-body sign can be immediately installed. Steven Bauman will assist with installation. A full-body sign was likewise considered an essential expense as the Mobile Market must make a good, professional first impression to draw people in off the road or sidewalk. POP signage (banners, yard signs) illustrating the trailer’s contents will be purchased to further enhance customer pull. May 2017: Freezer Purchase from Webstraunt Store (5) commercial freezers 4-foot wide with glass double display windows and 16 cu ft of storage. These unique double-stacked chest freezers will be so much better than the glass-topped chest freezers currently in the prototype Mobile Market. These new freezers are a hybrid of a chest freezer and an upright, with all the efficiency benefits of a chest freezer and the display benefits of an upright. Marvin Bauman will install the freezers, LED lighting and any additional electrical. 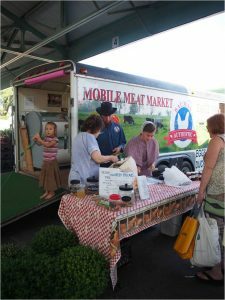 Late May 2017: The Mobile Meat Market rolls out on the streets! Schedules are made up for a 5 daily markets and the farmers take turns going on the road so that their farm tasks don’t suffer from neglect. Quickbooks was used as our POS system at the markets, as well as the general accounting system. This enabled us to cross-crunch numbers on sales, items, and expenses. Meats were sold by the pound, so using a sales receipt that calculated totals helped eliminate miscalculations. 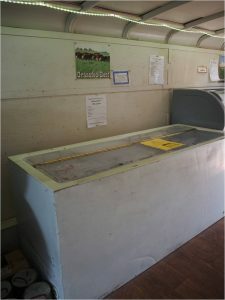 Action: Trailer purchased May 2017, but outfitting the trailer with signage and freezers was more complicated, thus we incorporated some new display freezers in our old trailer while the new trailer was being dust-proofed, electrified, and decorated. Hence, with harvest also delaying things, the new trailer was only fully completed in Oct. This still gave us two high-traffic months to get great customer and farmer reactions and results. Dust-proofing to keep trailer professional-looking after a drive down a country road. Electrical supply for the heavy electrical loads display freezers pull had us trying multiple options, including on-board generator and solar panels, as we work with the limited 110 volt supply available at most market locations. Heavy-duty flooring that looks professional and can stand up to the temperature changes and jostling. Increased Sales: We saw a 33 % increase in sales with new & improved market trailer in its inaugural year. 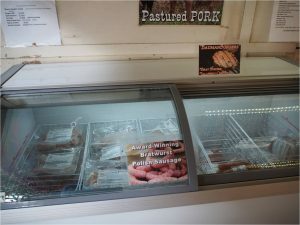 Increase Farmer Co-operation:The Bauman family, Williams, Miller, Ratzlaff, Cowan, West, Ssonko and Roecker family farms all contributed toward the products sold in the Mobile Meat Market. Additionally, customer requests for bison meat have us in discussion with a local bison rancher. Prior to this project, only the Baumans and Millers had co-operated. Market for Offal/Un-sellables: Just hitting the shelves is our newest offerings in the line of Raw Pet Food: dried liver treats and nutritionally-balanced Raw Cat Food. These we hope increase the profitability of our previous “waste products”. We have researched becoming certified to can our own broth in the event that consumer enthusiasm dies down for the DIY bonebroth trend. This would not only increase sales but also provide a more stable outlet for our bones. Currently, however, broth bones sell easily enough that we don’t need the hassle of value-adding to them. Type of Consumer:The customer profile varied by market location: from uber health-and fitness minded moms who asked us a million questions, to backyard barbeque kings who could care less how the meat was raised. This is one advantage of mobility – we can go into the areas where our desired customers already shop, or we can choose to diversify our customer base by moving to different neighborhoods. If we are having trouble connecting with the consumers in a city/neighborhood, we can move to another. Farmers’ report high satisfaction in marketing method. 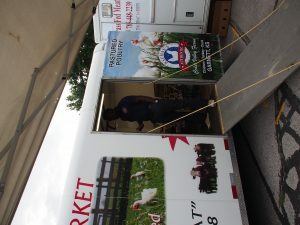 This Mobile Meat Market allows farmers to understand and connect with their markets, a point of stress with many farmers. Profitability is still being studied, as the best combination of marketing and product mix is tested. In this environment, it’s the little things that make a big difference, such as finding ways to sell bones, and bundling. Especially a good fit for farmers who are doing their own processing or have good relationships with their processors, as this marketing method capitalizes on being able to produce artisan/seasonal products not mass-produced. Further collaboration with other farmers is key, as the more diverse the product mix, the more customers come to you. Having specials of “free homemade buns with burger purchase” was especially effective. The very best thing for this entire project was our beautiful “double-bubble” glass display freezers that showed off the product incredibly and was easy for customers to shop. Customers also raved about the tall trailer ceiling that made it more comfortable for them to shop. The extra effort and expense to make the mobile market appear just like a miniature store, including quality graphics, definitely increases customer trust. 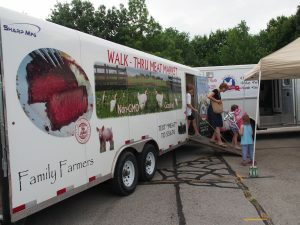 Displayed trailer at Bauman’s farm appreciation days May 18 and Sept 16. Attendance totaled 130. Further communication of results will continue at future conventions where Rosanna Bauman is a frequent speaker: Mother Earth News Fair, Kansas Rural Center, Cultivate KC, Kansas Farmers Union, American Pastured Poultry Producers Association, Kansas Association of Meat Processors, No-Till on the Plains, National Farmers Union, and the American Association of Meat Processors. This is not a magic bullet to make a farm profitable. It is a marketing option. This is direct marketing, so the farmer does have the ability to not just set their own prices, but to explain their basis for them directly to the end consumer. Further, the farmer has the ability to provide personalized service and respond to special requests, something that is often lacking in commerce. Because the farmer is in conversation with the consumer, they can provide recipes and cooking suggestions for the less-popular meats, thus selling parts of the animals that previously were wasted. This can even carry over into regional/ethnic seasonings to meet specific, local markets. Essentially, this opens the door to providing all sorts of value-added products, similar to grocery store’s meat and deli counters. Instead of just selling whole chicken, I could be selling 20 products made from chicken. So, has the increased sales resulted in increased profitability for the Mobile Meat Market? Profitability is a moving target, not a destination. This mode of direct marketing INCREASES our ability to make a profit, it does not guarantee it. We are still responsible for tracking expenses and setting our margins at the levels necessary for profits. But this gives us more control over many of the variables. Marketing Advantages of Mobile Markets: Essentially, the mobile-market concept is a good alternative to a brick and mortar store-front. We were having trouble securing the necessary zoning permits for our farm store, this mobile market has proved to be an even better solution for us, especially given our rural location. It could also be used in the reverse: a farm-store could use a mobile market to expand their reach. We are most excited about the potential of this mobile meat market to solve food access issues in our rural food deserts, as rural grocery stores are closing at an alarming rate. Electrical supply to power the 9 freezer compressors was a challenge. They use 110 volt power, but often markets with access to power receptacles couldn’t sustain the load we would pull on them. We tried staging the compressors, and a couple of different generators and solar panels. The only thing that worked was, of course, expensive. A Honda EFI 7000 generator was the only generator that had the quiet sound and power as advertised. But it’s $4,000, so you want to be sure the mobile market is a direction you’re committed to before purchasing. We, however, do not regret this purchase as it greatly increases our marketing locations. Additionally, the power available at markets was often not reliable, so this generator is used even when we are near electrical plug-ins. Stability for Displays: We wanted the trailer to look like a miniature store, but that means that everything must be locked down or packed securely. At the same time, precautions must be taken to prevent the freezers from rubbing holes in the flooring or walls. This is much easier said than done, given that you have the side to side momentum from curves, forward momentum if sudden traffic stops are needed, and trailer flex if a curb is driven over (as happens with trailers navigating city streets) We also had to put transport blocks in the tracks of our horizontal freezer doors as those would also creep open during transit. Ventilation: Compressors put out a lot of heat. Enclosed trailers typically are not insulated. 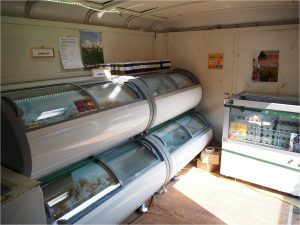 Ventilation at market is easily solved by a simple floor fan to move air through the trailer so it doesn’t become an uncomfortable shopping environment. When not in use, the rear drop-down door to shut to minimize dust and rain in the trailer. This then became too hot inside, stressing the compressors. We installed a $200 RV roof vent fan to help pull the hot air out of the trailer. Dust-Proofing: Perhaps this is a challenge unique to us, but we discovered that our rural location, with its graveled drives and busy farm traffic created challenges with maintaining a professional look and ensuring adequate ventilation. When purchasing a trailer, we paid special attention to door seals. The Williams, being primarily a 2-person operation, are grateful for the marketing assistance this new channel provides. The Miller family at Sunnyside Farm is grateful for the option to partner with the mobile meat market for their poultry sales. With a young family, it’s not feasible for the parents to be off the farm much. The Bauman males, whom all classified themselves as “not a salesman,” where quite surprised at how easy it was to talk to “city folks”. When you are passionate about what you do, it’s no longer selling, it’s sharing. And passion sells in direct marketing, because it’s less about what we are selling and more about Who is selling it, especially since consumer trust in their food and those who produce the food is at an all-time low. Of all the potential products that can be marketed using relationship/direct marketing, food is the best fit. Customers repeatedly express their delight over the professional look of the trailer and the convenience of seeing the product prior to purchase. Relationship Marketing remains the best-kept secret of direct marketing farmers. Little research or education is being done on this particular topic/skill for direct-marketing farmers.